Place almonds on a cookie sheet and toast in the oven for 10 minutes, stirring halfway through. Place toasted almonds, flour, salt and cinnamon in a food processor. Process until finely chopped. Set aside. In a mixer, cream the butter and 1 cup powdered sugar for 5 minutes until light and fluffy. Mix in vanilla and almond extract until well combined. Mix in almond/flour mixture until dough forms. Using both hands, roll 24 balls (1-inch each), and place them on a lined baking sheet. Smash each ball down slightly. Place 1 cup powdered sugar in a bowl and dip each cookie in the sugar. 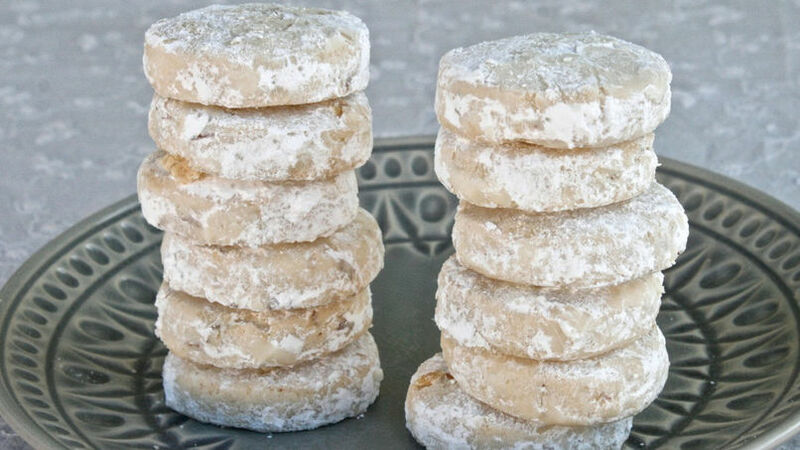 These cookies can be stored for up to 5 days in an airtight container. My auntie Rosie is the reason why I have a love of food and the person who taught me culinary art. She can whip up anything with whatever is inside the fridge at that particular moment and it'll taste beyond amazing. She has a magic touch for spicing things up. But she’s also a whiz at baking. One day she decided to make Mexican wedding cookies and invited me to watch. As she went through the process, I remember it felt like I was watching some mad scientist creating their best work and I was lucky enough to be witnessing it firsthand. This is the recipe I learned that day. Have fun creating these “mad” cookies and make sure to stuff your face with them for the holidays!